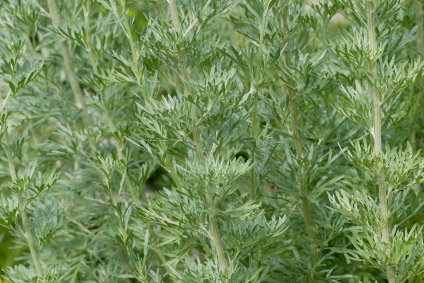 True Absinthe or Wormwood is native to Europe but commonly referred to as Mugwort (although technically incorrect) in the USA, where it now grows as a weed and is also cultivated. The oil should not be confused with the Chinese so-called “mugwort” or "absinthe" oil which is derived from a different species and contains about 40% borneol. While much cheaper in cost, the oil coming from China should not even be referred to as Absinthe (or Mugwort) because it is chemically very different than that of true absinthe oil. For centuries in Europe this herb was used to treat a host of diseases and disorders including intestinal worms, gout, jaundice, kidney stones, pain and swelling suppression, promotion of menstruation, as an antidote for drunkenness and various poisons, as a bitter tonic, appetite stimulant, external antiseptic and as a strewing herb to mask bad odors and drive away vermin. The oil is steam distilled from the leaves and flowering tops of the dried herb. The quality wormwood oil will vary with the condition of the herb and yields are generally low, in the range of 0.27-0.40% by weight. The oil is a very dark green to bluish-green or brownish-green color with an intensely herbaceous-green, sharp and fresh top note. The odor is reminiscent of cedar leaf oil but not as sweet and more dry-woody in the body note, giving a very interesting and unique odor for perfumery. The bluish-green color is due to the presence of a small amount of Chamazulene (generally less than 1%) , which is not present in the herb itself, but generated from Artabsine during the distillation process. The main component of the oil is beta-thujone (typically 35-50%), a known neurotoxin, and it is because of this that the notorious liqueur known as Absinthe was banned first Switzerland then in the US and finally in France in 1915 which greatly reduced the world production of the oil. Most all the so called “absinthe” liqueur on the market today is now flavored with anise, giving it a licorice-like flavor and is not reminiscent of the original absinthe beverages of the early 1900s. Despite the prohibition of absinthe liqueur, fractions of wormwood oil are still used in the flavoring of Vermouth to this day.